This is a bit of a variation on the Time Travel posts. Usually, I post an old photo and compare it with a new one, showing how little has changed. In this case, however, there’s quite a difference. Although I suppose you could say that the more things change, the more they stay the same. It’s all a matter of perspective. In this case, the photo above is a great aerial view of Neude, one of the big squares in the middle of town. This is where the old post office is located, and where many of the festivals set up temporary housing. There’s almost always something going on at Neude, even if it’s just the cafés setting up extra seating. The aerial photo was taken from the Neudeflat on the top of the tall building in this next picture. The big brick building is the former post office. You’ll notice that the aerial view showed the square being used for parking. I think that was common through the 1980s, perhaps even later. However, as cars became less welcome in the city center, and as bicycles became even more prevalent, there’s been a shift in how Neude is used. The street on the left of the first photo is one of the main thoroughfares through the city center, but looking at the first photo, taken sometime in the 1960s, I can see how the cycling infrastructure has changed. There are now dedicated bicycle lanes on the main street. In fact, I was surprised to learn last week that much of the cycling infrastructure here has been relatively recent. Mark, at BicycleDutch has an excellent blog post and video about how the Dutch cycling infrastructure as we know it now came about in the 1970s. It’s definitely worth watching. Thanks, also, to Breigh for directing me to this particular video. The use of Neude has certainly changed since that first photo. Yet, as I said, the more things change, the more they stay the same. You see, on Saturdays and shopping Sundays, there is once again parking on the Neude, but this time it’s bicycle parking. 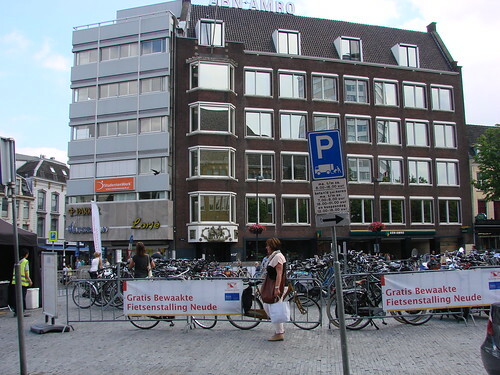 Each weekend, these mobile bicycle parking lots are set up by the city in various locations around town to give people somewhere safe to park their bicycle for free. This allows people to bike into the center, park their bike and then go on foot to do their shopping, etc. It also means that the regular bike racks aren’t further packed, making it difficult for everyone. It also keeps the city a bit tidier, since you don’t have the same volume of bikes parked in random spots. Trust me, they’re still everywhere, but these fietsenstalling always seem to be in full use when they’re set up. This entry was posted in bikes, history, photos, time travel and tagged bicycle parking, bicycles, city life, fietsenstalling, Neude, photography, time travel, Utrecht by Alison. Bookmark the permalink. I went to see a movie at Rembrandt theater on a Monday night at least 25 years ago. It was the cheapest night to watch a film. So I parked my dad’s car at Neude right in front of the postkantoor. I didn’t put enough money in the parking meter and when I got back to the car a police officer was writing me a ticket. I begged him not to but he was unrelenting. When I got home I told my dad what happened. He had mercy on me and paid for the ticket. I never parked there again. Now parking is extremely expensive in Utrecht. A few weeks ago I was in Sneek and I paid 2 euros for the whole day! It really is unbelievably expensive to park in the city center, isn’t it. I’ve heard people at the parking meters swearing when they realize the cost! Isn’t it something like €4 an hour? €2 for a whole day is amazing! And how nice of your dad to take pity on you! How does the guarded parking work? Do they give you a number or something? Honestly, I don’t know, since I’ve never used it and not paid close enough attention. I assume there is some sort of number/ticket involved. Yes, I’ve noticed in different photos that there are more lines on the streets marking bike paths than there used to be. The temporary free fietsentallingen are marvelous! There definitely are a lot of bike paths clearly marked on almost any major road, either with paint or with actual small barriers. 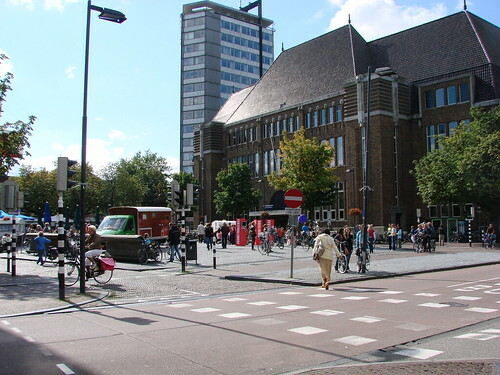 There are also plans to build an underground fietsentalling by the Stadsschouwburg to take care of the massive number of bikes that are always parked on the grounds, due to the number of student organisations, hostels, and locals. That would be good. That has been a huge bike mess since at least the early seventies, when I first went there.